Intreface are implementation partners of Bitrix24, providing customisation, hosting, training and support for businesses in Europe and North America. They focus on building systems which provide greater speed and control for organisations. Bitrix24 include a tool to sync your external email client with contact in the CRM by CC'ing a system email address. When sending an email from Outlook, Gmail or another email client, the user adds an address such as crm@mydomain.com in the CC field and Bitrix24 can locate the relevant contact in the CRM to attach a copy of the email to. This works well and is simple to set up but it cannot sync incoming emails which do not include the system email address as a CC. So most incoming emails will not sync to the CRM. Intreface have now developed full synchronisation of incoming emails and there is no longer a requirement for a system email address to be included in the email. Bitrix24 self-hosted allows you to create email boxes which can be used to trigger things such as helpdesk tickets. We have extended this functionality. 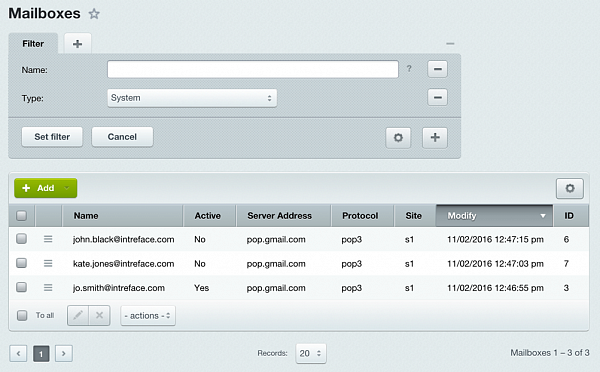 The admin creates a mailbox for each user in the Control Panel. With this in place (and a bespoke rule running) incoming emails to these accounts will find the contact which matches the sender's email address and add a record to the contacts stream. You also receive a notification of the new email. Time saving, more accurate records and faster response to enquiries. Also, with emails inside Bitrix24, rules can be created to run workflows on messages from specific contacts or with specific subject text. Contact Intreface for a demo to see what Intreface and Bitrix24 can do for your business.